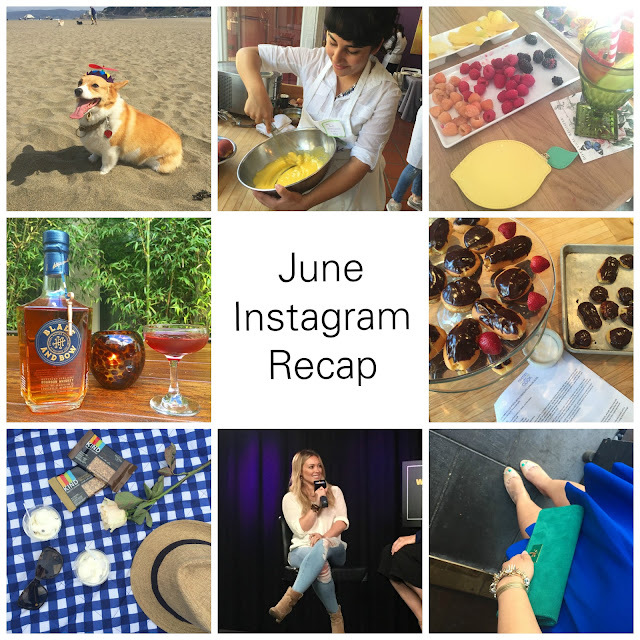 As I mentioned in my last post, I had been thinking of doing a recap of all the events I attended in June. I did a better job documenting them via Instagram, but some of the images I am sharing may not have made it on my Instagram feed (yet!) These are just some of the highlights and I am hoping this becomes a regular thing for my blog! I also attended a couple of parties hosted by local startups. One was the Gold Rush SF event hosted by Rocksbox, where I took some polaroid photos with some fellow SF bloggers. The other was the Live from SF party hosted by Poshmark at Mercer. Chelsea invited me attend a Party for a Better World sponsored by the Better World Hub. The Party's focus was to promote organic products such as Numi Tea, Marys Gone Crackers, Nature's Organic, and Equal Exchange. The organic products were not limited to food, and even featured toys, beauty products and clothing. There were samples, a food competition and a raffle at the end. I won the breakfast food packet on the bottom right and left with a pretty impressive haul of organic products. It was a great way to be introduced to organic products and to be able to try them. I found out through Gal Meets Glam's instagram account that she would be hosting a collaboration event in SF kicking off Birchbox's pop-up shop at GAP. For $15, you can pick out your own samples. I am pretty excited about to try out the products I picked out. On the same night, I made my way over to the Casper Snooze Bar pop-up. I tested out a Casper mattress, enjoyed gourmet waffles and had my dream interpreted by a talented local artist, Frances Marin. I recalled a dream as a kid passing through bushes of lavender, and I love how she illustrated my dream. I was also pretty stoked with the experience and being able to take some cute slippers home with me. I was invited to dinner and a whiskey tasting by Blade and Bow. I will be doing another post sharing a couple of recipes of the mixed drinks I tried, but I will say the food was delicious and it was great that I had a chance to experience this with my fellow foodie bud, Chanda. I am a suggested user on WE HEART IT, and randomly I received an email asking if I could be free for lunch on a Wednesday to meet Hilary Duff. I RSVP'd hoping to get picked, and was selected for an exclusive Meet and Greet with Hilary Duff. The weather for June was pretty inconsistent, but we actually had a couple of days where it was so hot that I appreciated the invite to taste SKYY Vodka's latest line of vodka SKYY Barcraft hosted by Victoria Smith (@sfgirlbybay). There was a cute station to dress up your drink, and I had a blast trying out each of the new flavors and decorating my drinks. On an unrelated blog note, Armando and I adore corgis. So we made it our mission to attend the Norcal Corgi Con, a meetup for corgi enthusiasts at Ocean Beach in SF. This dog is named Dog, and I thought her hat was simply too cute! It was fun watching and playing with the corgis at the beach. After the morning in the beach, I made my way to North Beach to bake French Souffles, Custards and Cremes blogger friends (Jennifer/Laurelai/Chanda/Kat) at the Parties that Cook kitchen hosted by Maison Jules. I worked with my group to make Vanilla Bean Creme Brulee Ice Cream. It was my first time making ice cream from scratch! We worked on using fresh peaches as part of a garnish to our ice cream. Tasting all the food at the end was the best way to end our cooking class. On the final Sunday in June, Armando and I attended Summerthing, a free concert at Golden Gate Park, sponsored by Alice 97.3. We layed out our picnic blanket , enjoyed free Clover Ice Cream and listened to Elle King, Rachel Platten, Matt Kearney and Kelly Clarkson. The best was saved for last, and the month ended with Armando and I celebrating our 9 year anniversary. I am very happy to have spent that much time with my best friend and partner-in-crime, and I can't wait to see what adventures are in store for us together this year. Hope you enjoyed my monthly recap. You can always follow my daily adventures on Instagram @willbakeforshoes. Until next time!